I wonder why the bamboo is red. 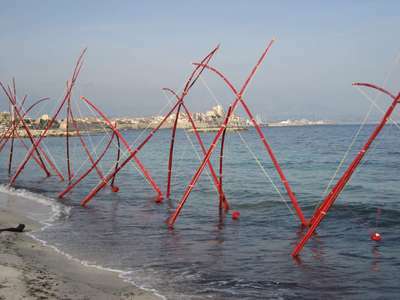 I think your work on the beach of Nice is wonderful in its calm sea. I have worked on the Pacific and Atlantic and the beach is far too rough. I made a bamboo work in Korea (large bamboo that you have used) that was on the river flood plain. The wonderful Korean artist photographed it when the rive was in flood in October 15 months after the work was made. Wonderful! You got the photo that I meant to take but didn't get around to before I left for the USA. Isn't the sculpture something? I couldn't decide if it was something to do with sailing or fishing or an art...John found the fellow there once and got a brochure. And you got the scoop too. Good job! I see you've been busy since returning to Antibes...we've got to talk about writing again, too. So many fun things to work on and so little time.